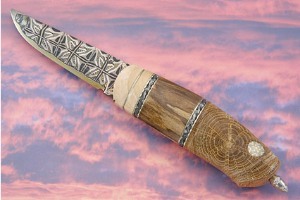 Description: Swedish knifemaker Greger Forselius has a sense of design rarely found elsewhere. When his vision is combined with the artistry of damascus forged by renowned bladesmiths Mattias Styrefors and Jonny Walker Nilsson, the result is a knife of elegant, graceful complexity. Collaborative blades by Mattias Styrefors and Jonny Walker Nilsson are highly sought after. 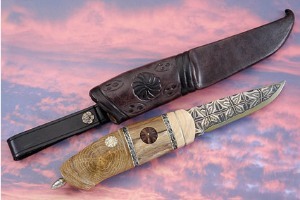 Both makers are independently well known for their skilled craftsmanship and attention to detail. The two have often worked together and continually spark each other's creativity. The tiled steel combines 20C and 15N20 carbon steels with pure nickel. 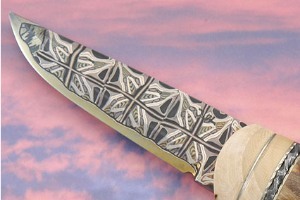 A mosaic pattern explodes along the length of the blade, delighting the viewer with the high contrast and intricate pattern. The edge reveals a central 20C carbon steel core. Jonny has signed the left side, whereas Mattias signed the right side of the blade. 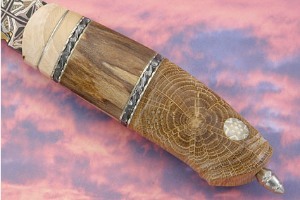 The stacked handle is formed from three sections including mammoth ivory, oak and oosic. 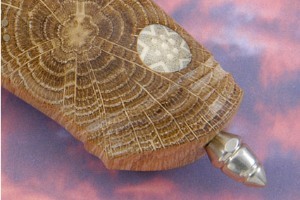 A thin nickel silver spacer separates the mammoth ivory layers, offsetting their color variegations. 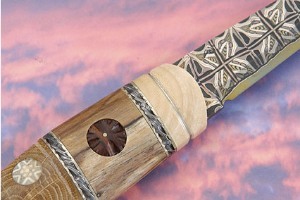 The oosic is inlaid with carved ironwood and a central decorative nickel silver pin. 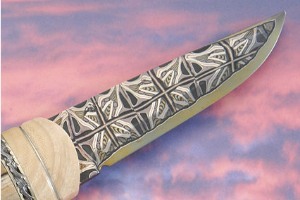 Alternating fileworked damascus and nickel silver bracket the oosic. 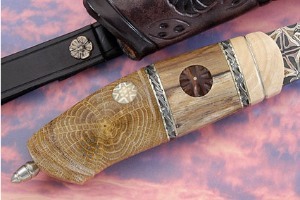 Finally, the oak has two offset scrimshawed ivory inlays which mimic the pattern of the oak grain, balanced by decorative nickel silver pin inlays. 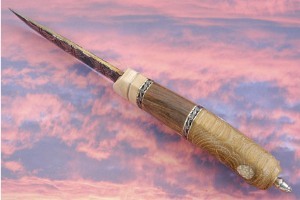 The resulting handle is comfortable in the hand and extremely beautiful. A restrained color palette from all the materials used allows texture, grain and finish to captivate -- this piece is incredibly nuanced in detail and in design. The handle is nicely finished with a nickel silver finial. Excellent fit and finish throughout.